The website for planning rail, bus, tram and ferry travel all over Australia featuring integrated maps of EVERY passenger rail service in Australia and a journey planner covering all train, tram, ferry and inter-town bus services. Queensland Regional trains -----Queensland Railways----- Brisbane to Rockhampton, Townsville & Cairns (Spirit of Queensland) Brisbane to Emerald & Longreach (Spirit of the Outback) Townsville to Mount Isa (Inlander) Brisbane to Roma & Charleville (Westlander) Cairns to Kuranda train Cairns to Forsayth "The Savannahlander" Normanton to Croydon "The Gulflander"
Australia's passenger railway system is a safe and convenient form of travel. 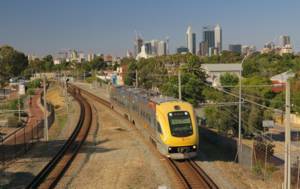 There are many passenger train and tram operators in Australia offering services - intensive suburban trains and electric tramways in major cities, to commuter trains and long distance interstate and luxury trans-continental journeys. Trains are high quality and all operators have reasonable on-line information about their services, but information is not co-ordinated. This site is a reference hub for anyone planning a rail or bus trip in Australia. Whether you're travelling from one suburb to another or making a trans-continental odyssey you will find the information here. We link to official web-sites of train and bus operators and help you book travel and accommodation online. We have eleven rail maps of Australia, its regional areas and cities showing every passenger railway and every station served by passenger trains. All suburban trains, light rail, country and interstate passenger train routes are shown. 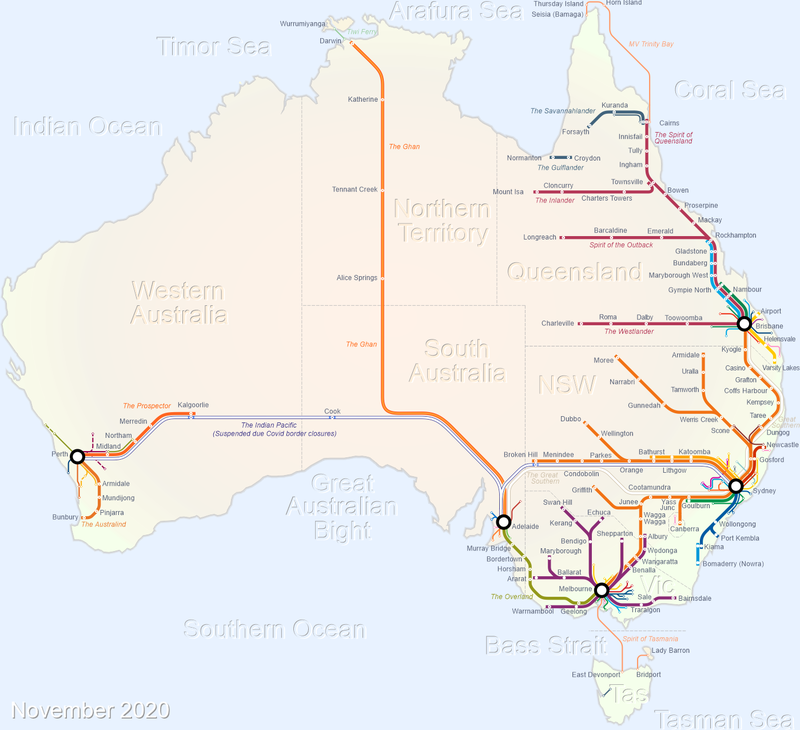 We've amalgamated all of our regional maps into one national rail map showing all non-metropolitan passenger train services and railway stations in Australia. Would you like a printed version of our maps? Through our partners at redbubble.com you can buy our maps as posters, prints, ipad covers and even t-shirts. All works are professionally manufactured and home delivered to you.